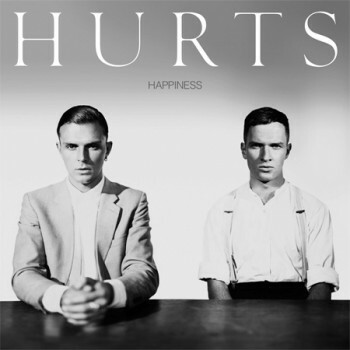 I don't know a whole lot about Hurts aside from what I learned from their wikipedia page. I know they are a British synthpop duo from Richmond North Yorkshire composed of singer Theo Hutchcraft and synth player Adam Anderson. Apparently there was a band at one point in time called Daggers where some of these songs are recycled from but because I never heard them as Daggers, they are brand new to me. The music is very moody and melodic and is perfect for an Sunday afternoon in. If you like solid writing and a strong produciton, you won't be disappointed. I highly recommend this album. 1. Silver Lining - Starts off the album with some pretty severe synth. I don't mind this, it's absolutely one of the things I love about this band. Another are Theo's vocals. This is probably one of the more "hopeful" of all the songs on the album. The song builds in intensity and mood which works out for the best here. I totally dig the moody vibe it sets forth and my expectations are where they need to be, I believe. 2. Wonderful Life - It really doesn't get better than this. This is pop storytelling at its best. I mean I haven't been this captivated in a song since "You were working as a waitress in a cocktail bar". The images this song invokes are incredible and when you pair it with the video, you have a one-two punch that can't be beat. I keep coming back to this song and the video because it absolutely captivates me. 3. Blood, Tears & Gold - This one, the jury is still out on. I think it will grow on me but it didn't jump off the page like the others. The production, much like all the others, is tight as a drum and I can't fault it in any way. There are just other songs that stand out more than this one. 4. Sunday - A good mid-tempo piece that is another of the "hopeful" tracks on the album. It's a redemption song, forgiving all that's transpired when you come back but if you don't come back he'll leave. A solid effort that fits in with the rest of the album. 5. Stay - This is probably one of my most favorite ballads I have heard in years. The writing and production on this song are spot on and I could see this song being an amazing single. It really has a quality that sticks with you and fills you up like a warm beverage in the dead of winter. I think as soon as you hear this song, you know where it stands and you know exactly what it means to you. There really is no guessing with this song. 6. Illuminated - With or without this song, I won't really lose sleep. This is kind of like the outfit in a designer's fall collection that carries the vision of the whole line but really isn't important to the overall look. 7. Evelyn - I don't know who Evelyn is but after hearing this song, I wish I did. Another piece of storytelling at it's best. I don't want Evelyn to leave. I don't know what's wrong with him that requires medicine but she doesn't need to leave him. I love this track. 8. Better Than Love - My first single and introduction to Hurts. This song came to me exactly when I needed it to and was exceptionally receptive to it. The song is huge and builds and builds and pulls you along for the ride whether or not you signed up. Don't worry, once you're there - it's totally ok.
9. Devotion (ft. Kylie Minogue) - My first reaction when I heard Kylie on this track was t to think of her foray with Nick Cave. I like hearing a bit of melencholy and darkness to her voice. I think it's an outstanding choice on her part and I think she did not misstep in the least bit. I dig the song and where they are going with it and I think it would do amazingly well as a proper single. 10. Unspoken - Synth with an orchestral undertone. Another song about moving on and making peace with yourself. I dig the build and the over all feeling of the song. Around the bridge, when the piano comes in and things start building more is when this song really shines. 11. The Water - A good way to end the album. Nice and easy. Nothing jarring or over the top, just simplicity. I think this was a solid choice. The rest of the album had moments that were big and bold and for this to just flow out like water is poetic. The lyrics are solid and just relax you. Ha. There is a hidden ballad to a woman named Verona. It's very pretty and a bit unexpected. I forgot how much I enjoyed the hidden tracks.